If you’re working in the marketing field, you probably assume executives favor outbound marketing over inbound marketing. It’s time to stop assuming and get down to the facts. The annual Hubspot Sales and Marketing Report was released and found that senior executives may be more open to inbound marketing than you think. Companies are worried about increasing leads and conversions, but not the cost of doing so. 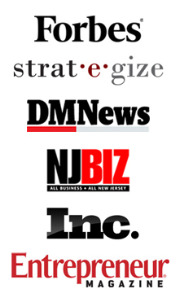 Inbound works for B2B, B2C, and nonprofit. 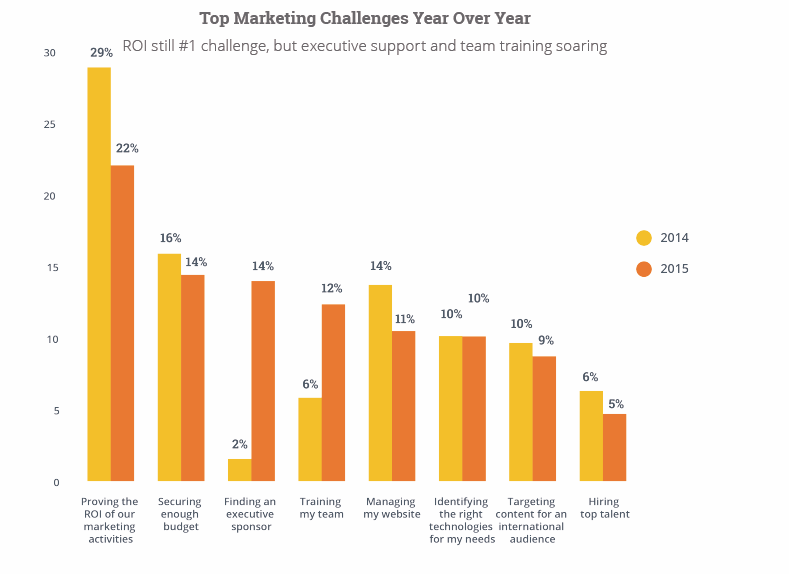 ROI is still the biggest challenge marketers face, but with the ability to increase ROI with inbound marketing, executives are favoring this marketing tactic more than ever. Hubspot’s data showed that the higher their position, the more likely they’ll favor an inbound strategy over outbound to generate a positive ROI. Inbound catches up to outbound at the non-executive VP/director level, and passes it at the executive rank (executive-level personnel represented over a third of all survey respondents). 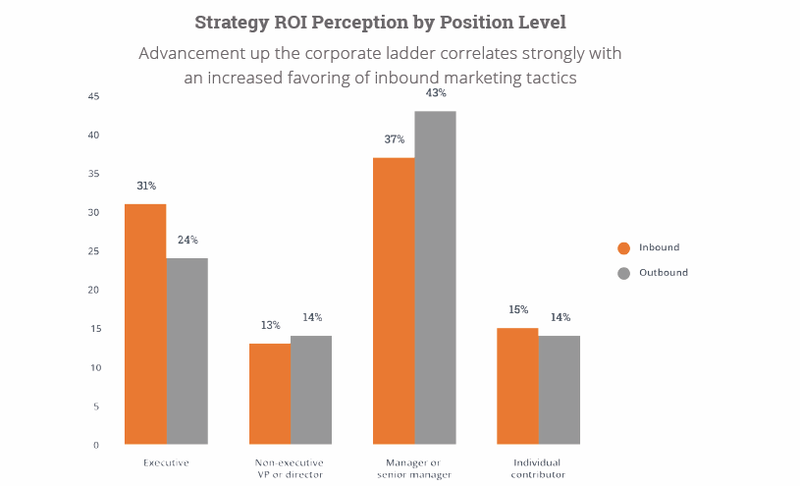 High level executives are focused on the numbers that surround their business and inbound marketing is perceived to be the best marketing approach in terms of generating ROI. Inbound generates more qualified traffic which helps grow your business. If you believe that inbound is more successful than outbound, there are numbers to support your case. Inbound shows a higher case of ROI than outbound by a large percentage, regardless of company size. 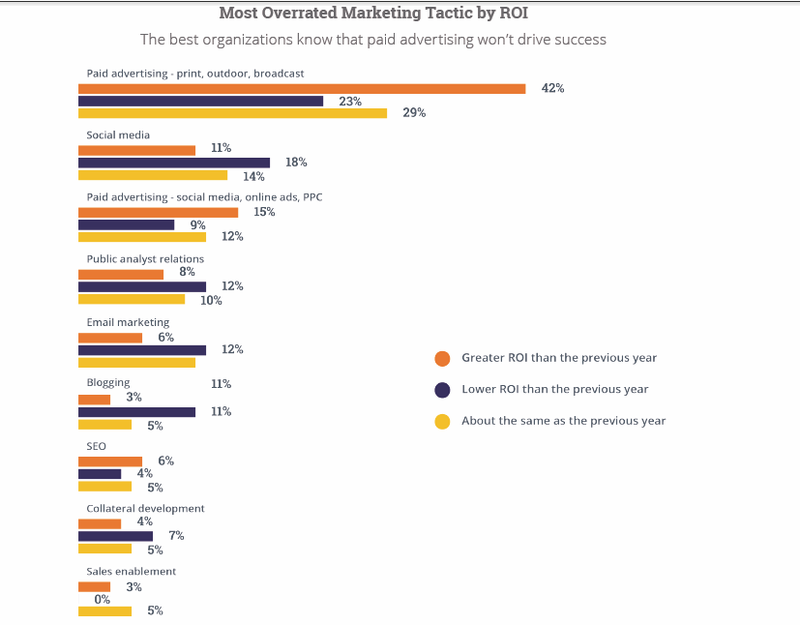 Approximately 32% of survey respondents whose companies identify as primarily outbound organizations called paid advertising the most overrated marketing tactic --the number one answer by a wide margin. While this could be explained by large companies (200+ employees) throwing money at paid as a sort of diversification of their marketing portfolio, it bears repeating that the smart money is on inbound. Recent trends in advertising and technology further support the executives’ shifts in favor towards inbound over outbound. While marketers begin to shift their budgets to creating value through content, consumers are starting to take action against ads that purely interrupt. The rising level of interest in ad blockers illustrates this trend. Another surprising find from the survey is that finding an executive sponsor and team training have surged in their perceived importance. Specifically, finding an executive sponsor was more than seven times as likely to be cited as a challenge in 2015 as it was in 2014, while training one’s team was more than twice as likely to be cited. The use of freelance and agency talent is on the rise. According to the tenets of inbound marketing, marketers should create compelling content that reflects their company’s voice and brand while helping the consumers of this content turn into website visitors, leads, and customers. This doesn’t mean that people who write content for your company have to be from your company. 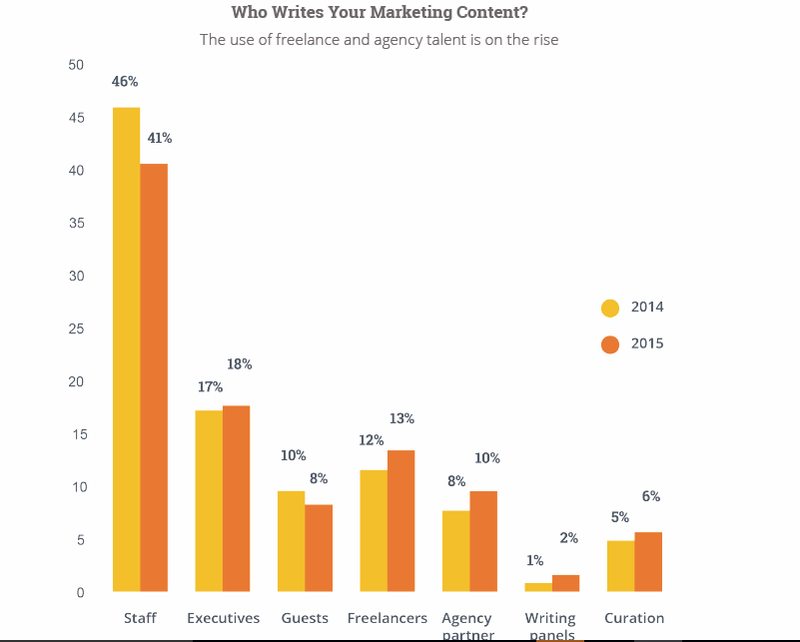 The survey showed an increase in the number of respondents who indicated they use freelancers and agency partners for content creation. Download the full report for 72 pages of the latest stats, charts, graphs, and insights on the latest trends in inbound marketing and sales.